Roofers and roofing companies are high risk professions, so it is important and necessary to have the proper Phoenix Roofing Insurance to be certain that you and your roofing company are covered in the event of an accident or injury, so that you are not held liable for costly charges or lawsuits. Roofer’s Insurance in the Phoenix area is a specialized type of insurance which is essentially public liability and/or workers compensation. It goes without saying that roofing contractors face dangers on a daily basis. This is something that other types of contractors do not have to worry about. When you own a roofing company, your workers are often in extreme conditions, working in very high heats and at great heights and let’s face it, accidents can happen to either persons or property, or both. While these accidents are terrible, in and of themselves, not having insurance protection to take care of both the people and the structures can make a bad situation worse. Should a member of the public get hit by anything falling from a rooftop where you are performing work, whether your workers are, or are not physically there at the time it happens, you can be liable. With public liability coverage in the city of Phoenix, you are protected from any lawsuit and damages. Even something like some debris hitting someone’s vehicle can be an issue. Worker’s compensation covers your workers in the event of them being injured or even worse, killed, on the job. Any settlement can come to hundreds of thousands of dollars and could bankrupt your company if you do not have coverage, so this is vital. Another key point to think about is that, by not having roofer’s insurance, you will lose out on a tremendous amount of contracts you could possibly otherwise have gotten if you carried it. Many clients will not consider hiring you without having this insurance in place for their protection. (If someone were injured at their building and you did not have any insurance, they could potentially be sued). PJO Insurance Brokerage specializes in helping contractors get the right type of insurance and we have helped many roofing companies over the years put the proper protections in place. Roofers insurance is an industry standard for both residential and industrial roofing firms. Recognized firms acquire this type of insurance for every project they manage. When they specialize in home roofing work, they may be able to buy single liability policies that cover their workforce for the entire year. Familiarize what clients are searching for when they inquire for proof of insurance. There are many forms of roofers insurance, one of which being general liability. Roofing contractors should purchase general roofing insurance that safeguards the public. If an individual is injured due to a falling brick or equipment from a roofing project site, for instance, she may file a lawsuit against the contractor and possibly even the property owner for the injuries incurred. Once a roofing contractor purchases sufficient general liability coverage, this safeguards him/her as well as their corresponding business thus avoiding damage payments from business and personal properties. Accidents and injuries in the occupation are relatively frequent, even when you follow the necessary safety techniques for prevention, and all too often roofers without workers’ compensation or liability insurance, you may have to pay these large amounts of money out of pocket. Inland-marine coverage as well as umbrella policies are available to those who need it for large commercial roofing jobs! Not sure what Phoenix Roofers Insurance policy is right for you? Let us help you find the right coverage for you, with an excellent rate that is sure to cover you in the areas you specialize in, as needed! Be prepared for those risk exposures by obtaining proper Phoenix Roofers Insurance. 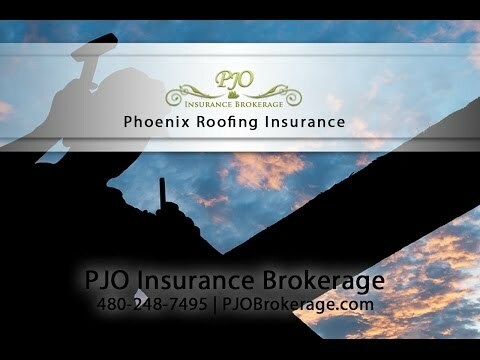 Top quality service, coverage and satisfaction to all of our clients is the number one goal of PJO Insurance Brokerage, and is provided to all roofers and roofing companies throughout Phoenix, Arizona and surrounding areas! We can help you determine an excellent PHX business insurance policy that suits your specific needs, as well as provide you with an estimate for your policy! Contact us today by calling 480-248-7495 or by completing the form below.